The DM series recorders in Australia are now manned by the Olympus DM-3 and the Olympus DM-5 digital voice recorders since the launch of the DM3 in early July 2011. To look at them you would be hard pressed to tell the difference other than the Olympus DM3 is silver and the Olympus DM5 is black. I only list the highest quality audio recording modes as these give the best quality sound and audio pickup. If you choose lower quality recording modes the maximum recording times will be greater than I have listed. I recommend using the highest quality audio recording modes. Only the DM-5 is capable of reading aloud a textfile, this feature is not available on the DM-3. Text to speech is a functional typically used by people who are vision impaired or have reading disabilities. Only the DM-5 is capable of playing DAISY (Digital Accessible Information System) books. DAISY books were intended to replace audio tapes for digital devices and have the ability to read-aloud books while also highlighting text and displaying images. DAISY books are typically used by people who are vision impaired or have reading disabilities. Only the DM-5 is capable of processing voice recognition commands to control the digital voice recorder. Voice recognition allows complicated key inputs using voice alone, for example to set the date and time or setting up timer record. 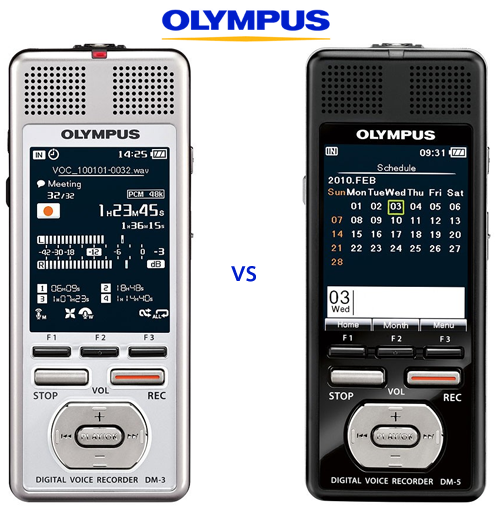 Voice recognition only controls the Olympus DM-5 functions is does not take your spoken words and transcribe them. Voice recognition is typically used by people who are vision impaired or have reading disabilities. Only the Olympus DM5 has the ability to store and display images imported from a digital camera. The images can be displayed on the DM-5’s large lcd colour screen. So there you have it. As you can see the Olympus DM-5 is really aimed at people who are vision impaired and give them a user friendly digital voice recording device. Both will record exactly the same audio quality files, the main difference being the size of the memory in each which in turn effects the maximum recording times which I have listed above. If you are not vision impaired the only reason I would see someone opting for an Olympus DM-5 over a DM3 would be if they are planning on being away from a computer for a large amount of time gathering audio that would exceed the in-built memory plus an addition microSD card’s worth of memory. That is alot of audio. Could you tell me, how to charge this device? Is this done by removing the batteries, or can you hook this one up straight to your pc to recharge?? The battery stays in the unit (DM-3 or DM-5) while recharging, simply USB connect to your PC or Mac and thats it. thanks! This is a great article – i have been torn between the DM 3 and DM 5 for a while. My main purpose for using it is to convert my speeches to text with Dragon Naturally Speaking. Is recording hours and hours of my voice at MP3 quality on the DM 3 suitable for this purpose? Or would I need to use the WAV format? Thanks for your comment, much appreciated. Yep high quality MP3 would be fine, just make sure that you record in quiet surrounding with as little background noise as possible.